Stand Up Paddle Boarding ! One of the fastest growing watersports in the world, stand up paddle boarding is growing leaps and bounds. You can do it on any body of water from oceans, lakes to rivers and bays. It’s a great full body core workout, builds balance and is another way to experience the water in the outdoors. People of all ages, skill levels, and experience can be up and riding in a very short period of time. There is even room to throw a small child or man’s best friend on board. Who Invented Stand up Paddle Boarding? Maui surf legend Laird Hamilton was looking for a way to cross train for big waves in the early 90’s. He grabbed a canoe paddle and his longest surfboard and found paddling while upright to be a fantastic workout. Many mistakenly believe he invented the sport of paddle boarding however its original roots date back over thousands of years to ancient Hawaiian, Peruvian and African culture. All 3 cultures had some form of paddle boarding however the Hawaiians are given the credit as the first to actually surf waves with a paddle for actual sport and had a word to describe surfing with a paddle – Hoe He’e nalu. How to Stand Up on your Paddle Board? Always start out in calm flat water and keep in mind you could be falling so unless you’re in the tropics a wetsuit may be a good idea. • Get the board out into the water so the fin is free from hitting the bottom. • Start out on your knees and take a few strokes on each side of the board. • Slowly stand up with one foot at a time and stay in the middle of the board with feet parallel to the stringer about shoulder width apart. • Keep a slight bend in the knees and your core centered over the board. 1) Stand Up Paddle Board – Paddleboards come in all shapes and sizes. The most common construction method is epoxy and fiberglass wrapped around an EPS foam core with one or several fins to help the board track in the water. A standup paddle board is much thicker than your average surfboard. 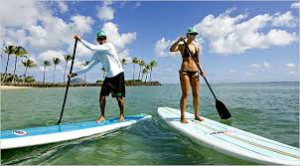 Paddle boards typically range from 8′-12′ in length, 28″ – 32″ wide, and 4″ – 5″ thick. If you’re just starting out the best thing to do is select a wider, longer, thicker board. This type will offer the greatest stability to learn the paddleboard basics on a flat body of water. As you gain experience you can progress to a much smaller board. 2) Paddle – Stand Up Paddles come in a variety of constructions from plastic, aluminum, wood, and carbon fiber with a variety of handle, blade and shaft shapes. The general rule is a paddle used with your paddleboard should always be 6″ – 10″ above the height of the paddler. Size your paddle on the longer side for flat water use and the shorter side for use in the surf. The blade is typically bent at a slight angle to the shaft to allow for more forward reach when taking a stroke. 3) Leash – A leash keeps your paddle board attached to you with a Velcro strap around your ankle (or calf) that is attached to the paddleboard. Leashes come in a variety of sizes and the general rule is to use a leash around the same size or slightly smaller than your board. In the event of a fall currents and winds can quickly sweep your paddle board away from you and in the ocean your board becomes a lethal weapon when carried with the force of an ocean wave. Always remember to use your leash. 4) Traction Pad – Most paddle boards come equipped with a traction pad preinstalled on the deck of the board. The traction pad is a soft layer of EVA foam typically grooved to provide grip and a soft cushion for the feet much like the sole of a shoe. 5) PFD (personal floatation device) – If you use your stand up paddle board beyond the limits of a swimming , surfing or bathing area the US Coast Guard requires you to have a USCG Approved life vest. Please see the following link by the WPA (World Paddle Association) regarding the Life Vest Safety Laws. With the paddle in one hand lift the board from the tail with the nose on the ground. Walk to the center of the board and shift the board’s weight back to balance on your head. You can then shift the board over to balance on your shoulder. To lay the board back down just follow the steps in reverse order. The carry handle is a small handle installed at the center point of the board to carry it to and from the water easily. Just lift the board by its handle and go. Many products on the market offer wheels to attach on one side of the board and a handle on the opposite side. This can be used to wheel the board along or be attached to a bicycle. Paddle boards can be strapped on any vehicle with car racks. Most surfboard soft racks will fit a paddle board. Or if your vehicle already has an existing rack system you can simply use straps to tie down the boards to the existing hard rack. Some racks even having locking devices to secure the boards from theft. Many people just throw a towel on top of the car and run straps thought the doors. For airplane travel many companies make travel bags to carry your paddleboard. These are typically padded but it’s always recommended to add some extra padding of your own such as towels or bubble wrap. Also keep in mind the latest surfboard and paddleboard board bag charges and size limits of your airline before you book your flight.